ISTANBUL — The Turkish army shelled on Sunday positions held by the U.S.-backed Kurdish fighters in northeastern Syria, east of the Euphrates River, in a new spike in tension along the borders. Ankara considers the U.S.-backed Kurdish militia an extension of its own insurgent groups, which it refers to as "terrorists and separatists," and sent its military into Syria two years ago to drive the group and Islamic State militants away from its borders in northwestern Syria. Recently, Turkey's President Recep Tayyip Erdogan vowed to expand the military operations to clear the borders from "terror." Tensions persist between the U.S. military and its NATO ally in the Syrian region of Manbij. 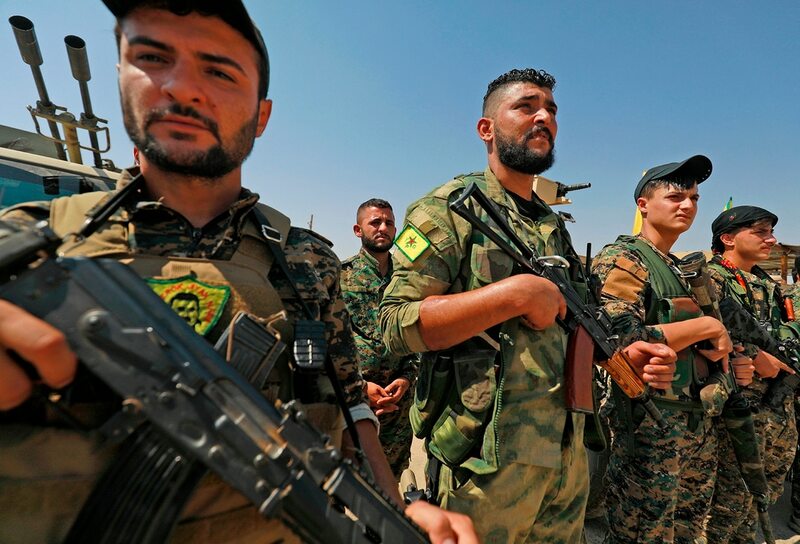 The Syrian militias, known as the Kurdish People’s Protection Units, or the YPG, are the backbone of the U.S.-backed force that is fighting Islamic State militants. The alliance between the Kurdish fighters and Washington soured relations between the U.S. and Turkey, a fellow NATO member. The rare Turkish shelling east of the Euphrates comes a day after an international summit on Syria hosted by Turkey, which called for an inclusive political process and for creating conditions to allow the return of millions of refugees. Speaking at the summit, Erdogan said Turkey has been among those most harmed by "terror organizations" in neighboring Syria. "We will continue eliminating threats against our national security at its root in the Euphrates' east as we have done so in its west," Erdogan said. Turkey’s president in remarks published Friday accused the United States of failing to abide by a deal for a U.S.-backed Syrian Kurdish militia to withdraw from a town it had liberated from Islamic State militants in northern Syria. The village is across the Euphrates River that separates Turkey-backed Syrian opposition forces and the YPG. The YPG said in a statement the shelling killed a Kurdish fighter from the Self Defense Forces. The newly formed forces are affiliated with the U.S.-backed Syrian Democratic Forces, leading the fight against ISIS in eastern Syria. The YPG said the Turkish shelling was “unprovoked” and is a distraction from the fight against ISIS in eastern Syria. "Any illegitimate attack against northern Syria will not go unanswered," the YPG said in a statement. Turkey's president said Sunday the Turkish military and allied Syrian forces have taken "total" control of the town center of Afrin, the target of a nearly two-month-old offensive against a Syrian Kurdish militia, which said fighting was still underway. The Britain-based Syrian Observatory for Human Rights and Kurdish Hawar news agency also reported the shelling, saying Turkish artillery targeted other villages east of the Euphrates as well. Hawar said there were no reports of casualties. The Observatory said the shelling in the villages west of Kobani, a stronghold of the Kurdish fighters, came while Kurdish fighters were on high alert following Turkish threats. The U.S.-backed Kurdish-led forces are fighting ISIS militants in their last pocket in southeastern Syria. The militant group has carried out a major attack on the Kurdish-led forces in some of the most intense fighting in the last few days, regaining ground and killing scores of fighters. The U.S.-led Coalition vowed Sunday to regain territory lost by its Syrian allies, describing the fighting as "difficult." “It is very difficult because we are in the last stages, where almost every (ISIS) fighter is in a suicide belt,” said Brett McGurk, the special presidential envoy for the coalition. Associated Press writer Sarah El Deeb in Beirut contributed to this report.